Once again this year, Brightcove is proud to be the online video platform powering a host of exciting video footage from the 2011 Consumer Electronics Show (CES) in Las Vegas this week. The Consumer Electronics Association, the organization behind CES, continues to expand its use of Brightcove throughout the CES website, showcasing video content from this year's show as well as highlights from previous events. Even though the event does not end until Sunday, CES has already published a wide range of video content from this year's event, including interviews, session footage, and full length, high quality quality videos of keynotes from major names like Samsung, Audi and Microsoft. CES is also leveraging the Brightcove platform to support a new feature this year, "CES TV" which is a high production show that provides important information about all facets of CES and major happenings at the event. 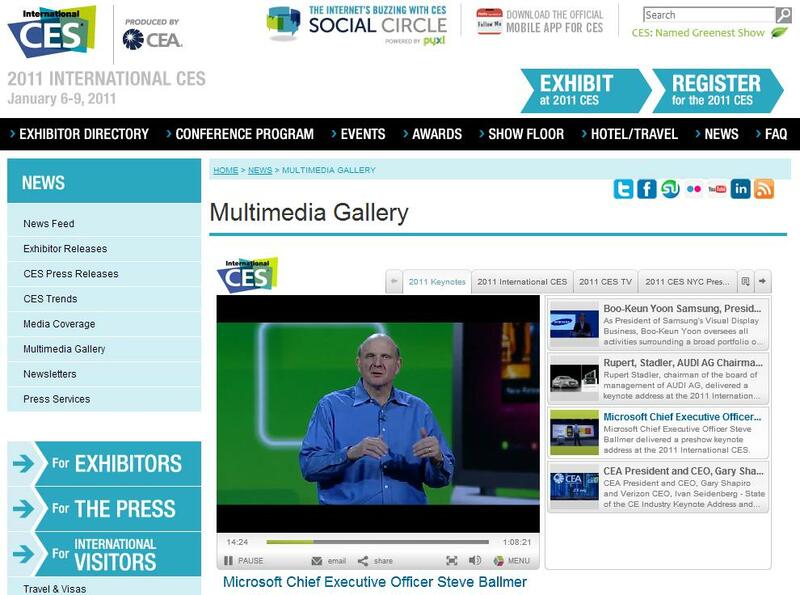 We look forward to again watching the events of this year's show unfold through CES' exciting online video content!